It seems as new houses are built, the kitchens seem to get larger with more creative built-in storage options. So what happens if you just bought a bungalow built in 1920, or a studio condo on the 48th floor in Manhattan? Those kitchens may not be built to hide all of your small appliances, pots, pans, etc. If you’re looking for more storage space, think outside the box and utilize forgotten space in your kitchen. If you have the budget and can replace your existing cabinets, opt for the taller 42’ upper cabinets, or custom cabinets that are made to go all the way up to the ceiling. This space can be used to store items that are not used as often. You can also utilize forgotten corner space by adding a Lazy Susan, or drawers that are made to fit in the corner. As we mentioned in our previous post regarding making tiny kitchens appear larger, pull-out shelves, rotating inserts and tilt out bins can be small changes that make all the difference in the world. Don’t stop there. If there is empty unused space in the cabinets where stacking isn’t an option, add shelf risers to double your storage. 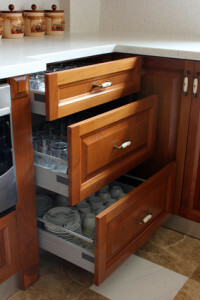 The inside of cabinet doors has recently become a hot spot for storage space as well. If you can think of a creative cabinet door storage idea, someone has most likely already made it. There are companies that make door racks for paper towel holders, spices, cleaning supplies, pot lids, towel bars, trash can systems…and the list goes on. There is so much bare wall space in a kitchen that goes unused. Think about mounting hooks and holders on the wall for items such coffee cups, utensils, a knife magnet rack or spice rack. This will not only free up more cabinet space, but allow access to items the cook needs within an arm’s reach. And when you run out ideas for the walls, look upward. Try hanging a pot rack from the ceiling as an artistic functional storage option. If you’re still short on space and are looking to remodel, consider your appliances. Do you really need a 6 burner stove top when you live alone? You can buy smaller appliances to allow room for more cabinets and counter space. Fortunate enough to have room for an island? There is often a lot of forgotten space on kitchen islands. Ask an expert about adding shelving along the sides and back of the island to store cookbooks and miscellaneous items. This area could also potentially provide housing for a recessed microwave or built in wine rack. There are tons of options out there for adding and creating more storage space to your kitchen. Hopefully this will help get your wheels turning. If you need more inspiration, refer to our Pinterest board for kitchen buyers to see pictures of more kitchen and storage ideas.